done, dear happy club members and guests! 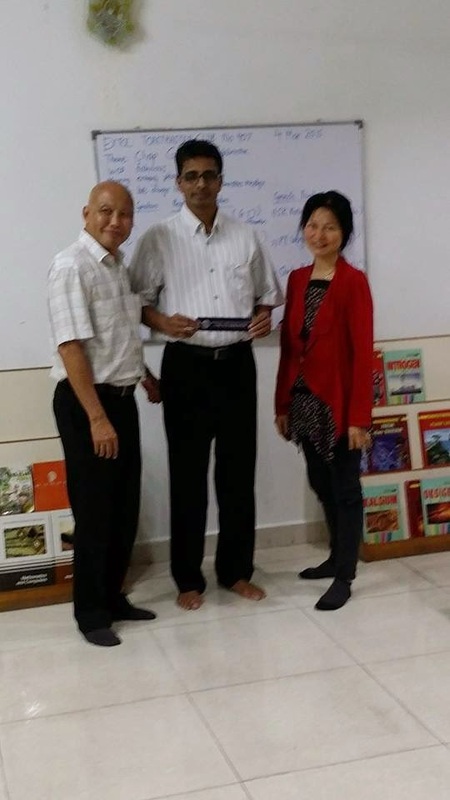 Our immense gratitude to Gerard Peter, ACS, CL from WIM Toastmasters Club, the General Evaluator for this meeting. Thank you, Gerard for gracing our meeting! 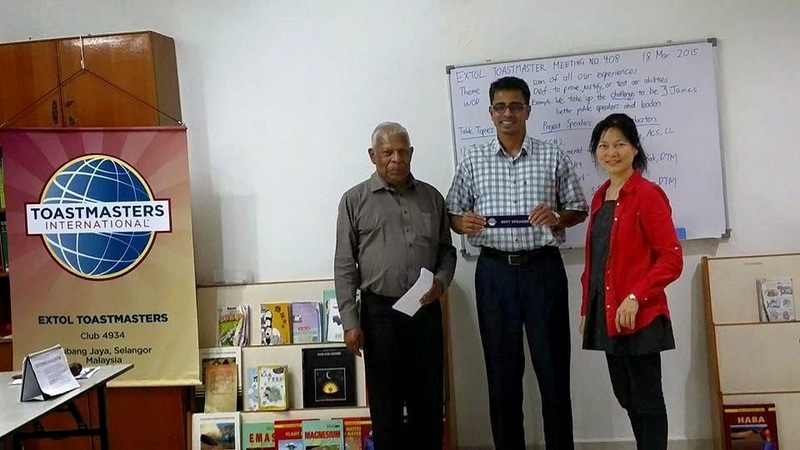 We also thanked our guests, Sook Hwa from IJM Toastmasters Club, James Chee from University Nottingham Toastmasters Club, Srinivas and Ricky Soo from MAD Toastmasters Club for their attendance. 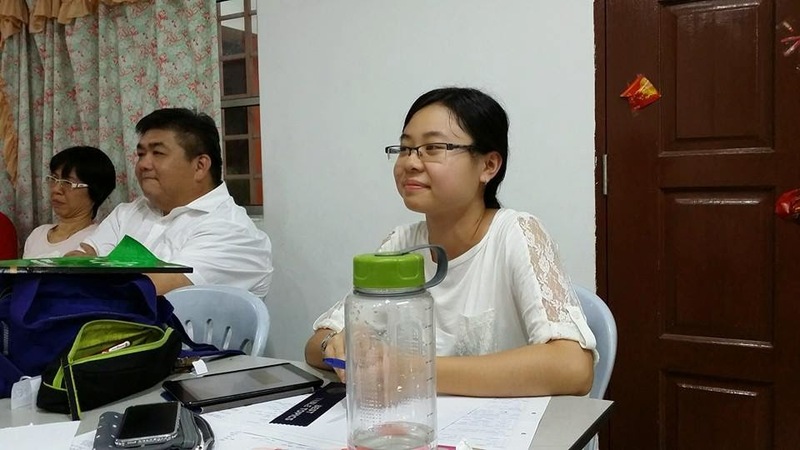 ASA, Nicholas Khoo called the meeting to order at 7.14pm. Well done, Nicholas! 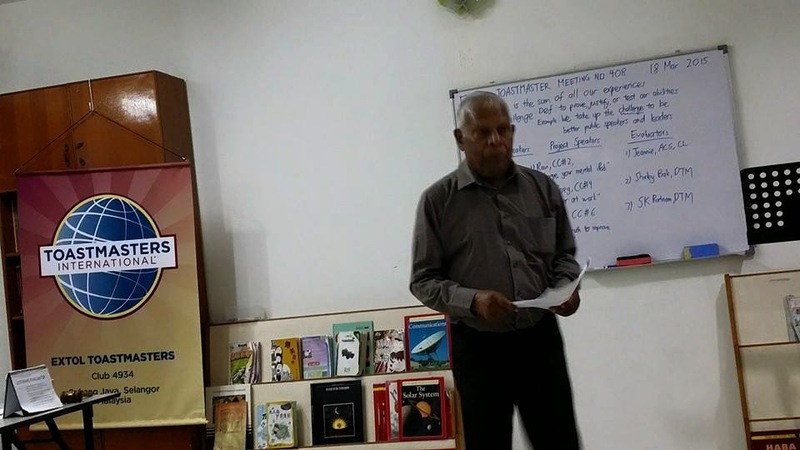 TME, SK Ratnam, DTM recollected the challenges faced by our club from an in-house club to its present community club status and thereafter managed the meeting efficiently. Brilliant job, SK! President, Jeannie, ACS, CL exemplified the theme, “Life is the sum of all our experiences” by illustrating that life is a journey full of experiences of our likes and dislikes and to leave a positive legacy. Thank you, Jeannie! Invocator, Ken Koh, ACB enlightened us on our fate and destiny which he revealed are held within the uniqueness of our finger prints. Thank you, Ken! 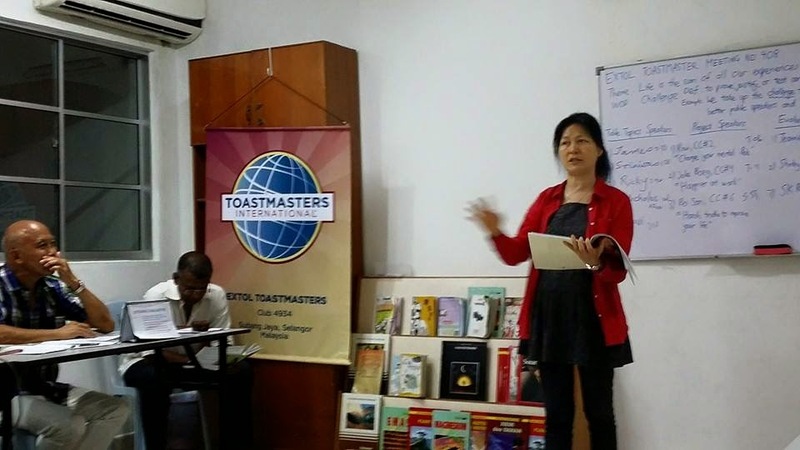 Table Topics Master, Tan Joke Boey emphasized the Word Of The Day, “Challenge” in her Table Topics session that enabled all impromptu speakers to utilize the word in their speeches. Well done, Joke Boey! James Chee took on the challenge to narrate on the stressful times he faced during his primary school years when he was pressured by his parents to excel in his studies. Looking back now, he appreciated the pressures from his parents. Srinivas compared the challenges faced by college students in India and Malaysia and stated that students in India had a tougher time as the minimum objective for them was a Masters degree. 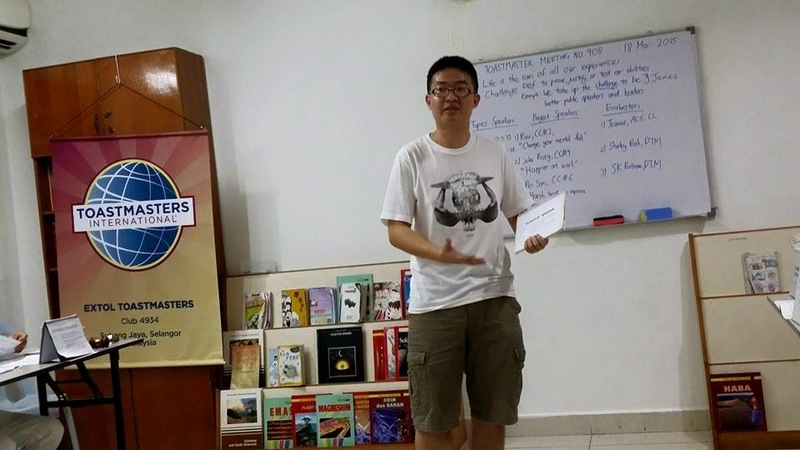 Ricky Soo informed that the challenges he faced today is firstly, losing weight and secondly but not least was the formation of his club, MAD Toastmasters Club over a period of six months which was so challenging but ultimately the club was chartered two months ago. Ravi discussed about the challenges that he faced at work, how he overcame them and currently, he was able to enjoy both his work and family life. 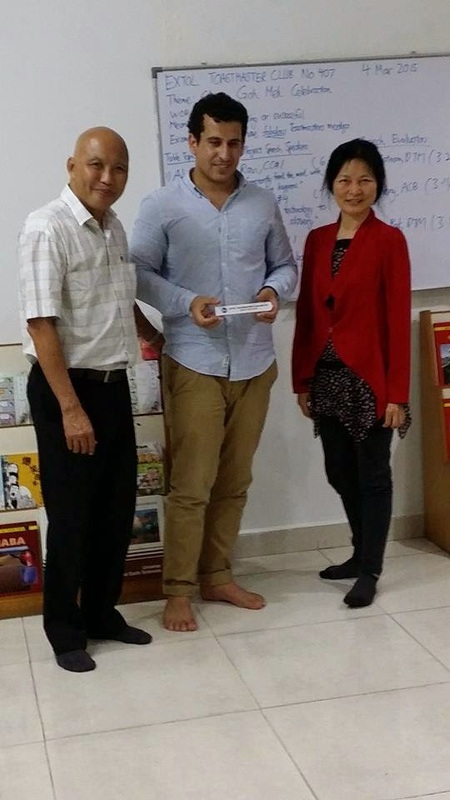 Nicholas Khoo revealed that he was currently assisting a politician and he aspired to be a politician in ten years time. A big round of applause to all the five gutsy volunteers! And the best Table Topics Speaker went to Srinivas. Congratulations, Srinivas! Humour Master, James Chee set everybody laughing on an anecdote about how he won the heart of his girlfriend in school. You are a humorist, James! Table Topics Evaluator, Jeannie, ACS, CL was very encouraging on her evaluations of all the five spontaneous speakers. You are a great motivator, Jeannie! Ravi presented CC#2 titled, “Change your mental iPod” which reminded us of the importance of silence in this rambunctious, chaotic and noisy world that was so illuminating. Fantastic speech, Ravi! 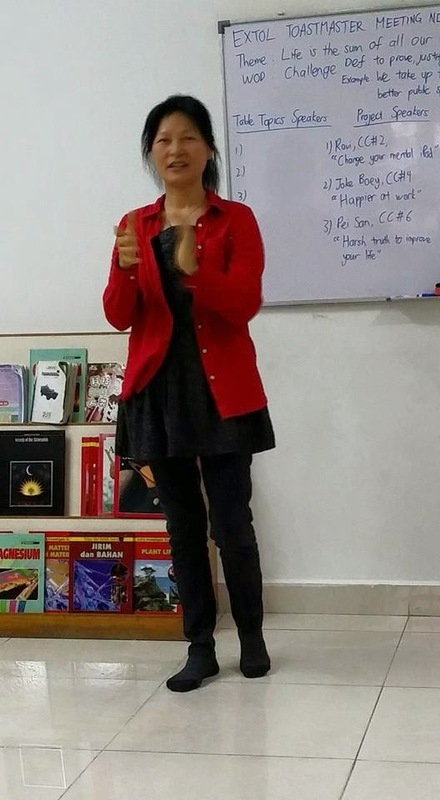 His evaluator, Jeannie, ACS, CL was mesmerized with his magnificent speech but she hoped that in future Ravi show a bigger display of his visual aid or pinned the A4 paper on the wall for the audience to read. Thank you, Jeannie! Second speaker, Tan Joke Boey presented CC#4 titled, “Happier at work”, whereby she discussed how she overcame many challenges at work and resulted in eventually enjoying her work. A very practical speech, Joke Boey! 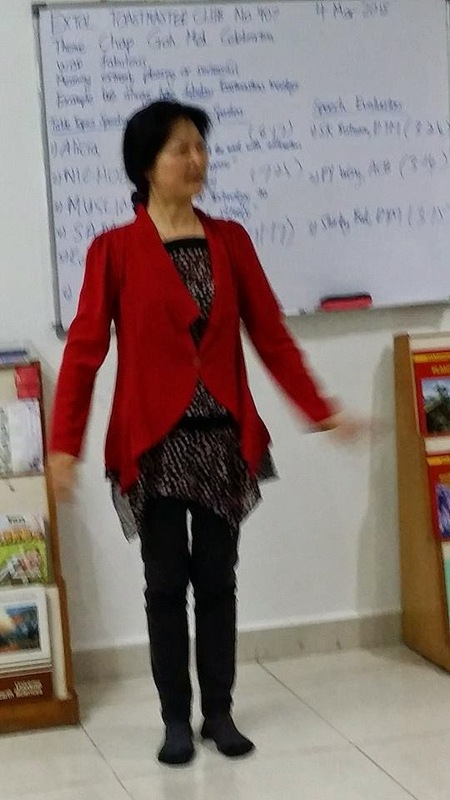 Her evaluator, Shirley Bak, DTM was happy with her speech delivery but hoped that she had employed some rhetorical devices to complete the speech objectives. Thank you, Shirley! 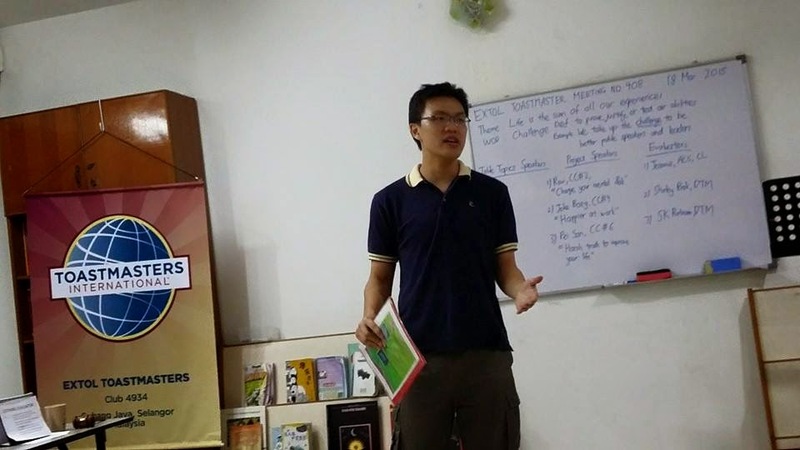 Pei San presented CC#6 titled ”Harsh truths to improve your life” which summated three harsh truths that we must challenge and overcome in order to improve our lives. Very informative speech, San! 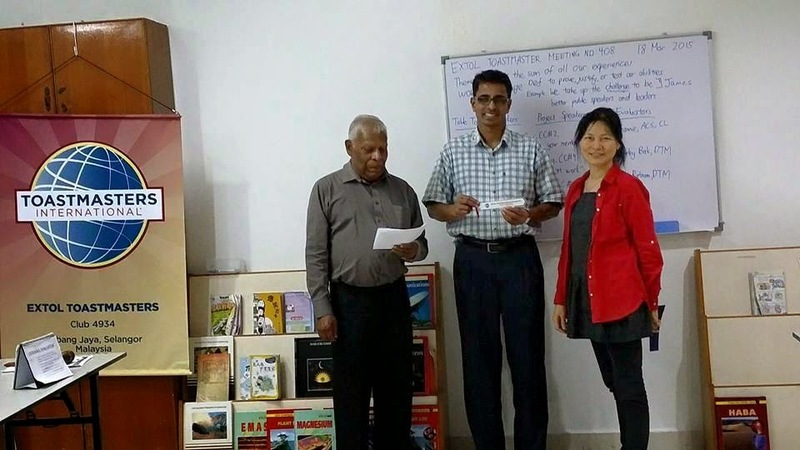 Her evaluator, SK Ratnam, DTM was happy with her fluent, well-prepared and smoothly-delivered speech although he hoped that she had chosen a storytelling approach to challenge her vocal variety objectives. Thank you, SK! And the Best Speaker went to Ravi! Congratulations, Ravi! As Jeannie, ACS, CL went overtime and only two speech evaluations were delivered within the allocated time frame, therefore there was no voting for best evaluators. 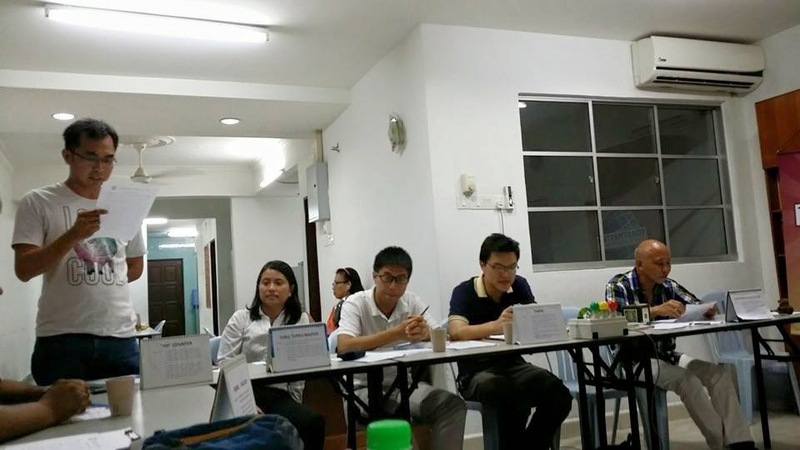 Ah Counter, Samuel Koh reported on all the speakers who used and did not use word crutches during the entire meeting. Well done, Sam! 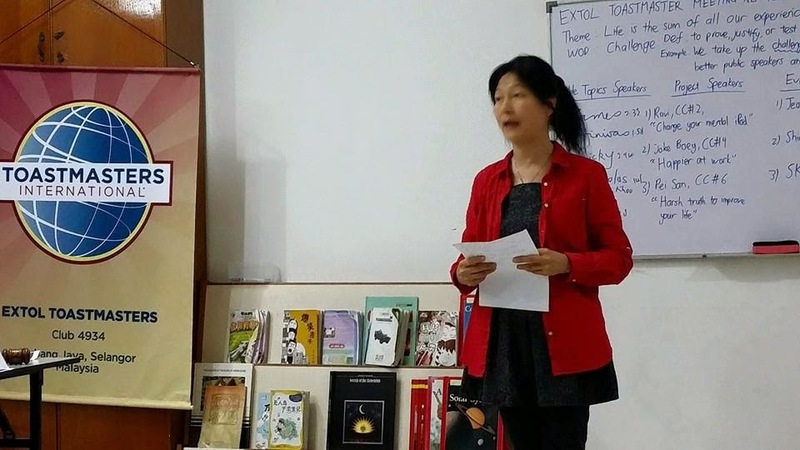 Grammarian, Sook Hwa mentioned that many used the Word Of The Day, therefore the word is no longer challenging. She indicated all the wrongful and creative usage of words and sentences and also wrong pronunciation of words by the speakers. Excellent job, Sook Hwa! 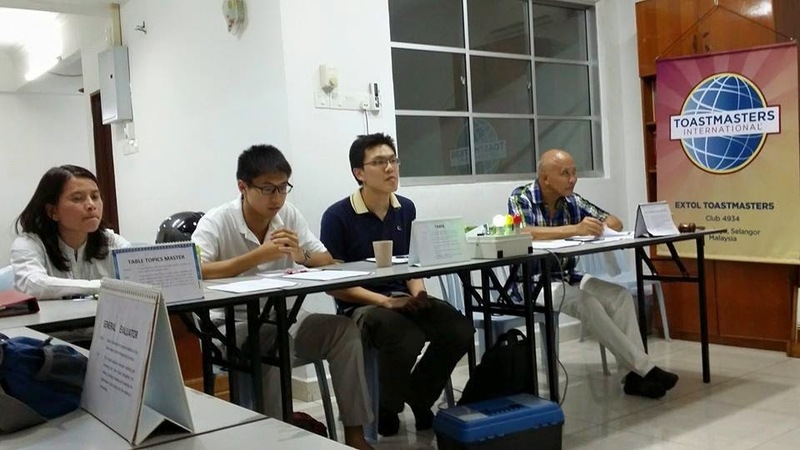 Timer, Ken Koh, ACB gave a meticulous report on the timing of the whole meeting! Kudos, Ken! 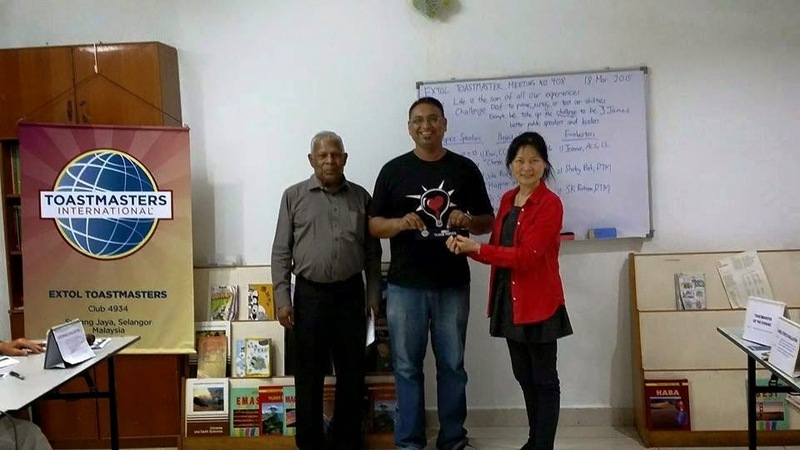 Pun Yew Kee, the Listening Evaluator gave six very tough questions but amazingly Ravi got four correct answers and received the Best Listening award. Awesome job, Yew Kee and congratulations, Ravi! General Evaluator, Gerard Peter, ACS, CL said that he noticed that not only he but everybody else were also welcomed warmly upon arrival and he enjoyed the meeting very much. 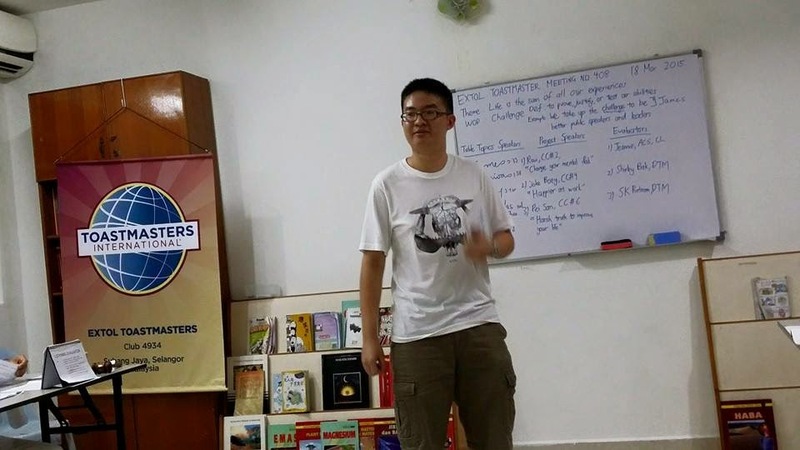 However, he hoped that there were some Advance speeches instead of only CC speeches at our meeting to allow the new members to experience higher level speeches. Thank you, Gerard, your comments are noted and we look forward to your visit again. In closing, President Jeannie, ACS reminded that the Division C International Speech and Table Topics Contests will be held on 12 April 2015 at MIDA, KL Sentral at 12.00noon. Everybody was encouraged to go and watch the Area champions in action to experience higher level speeches! See you again on 01 April 2015! Good night! 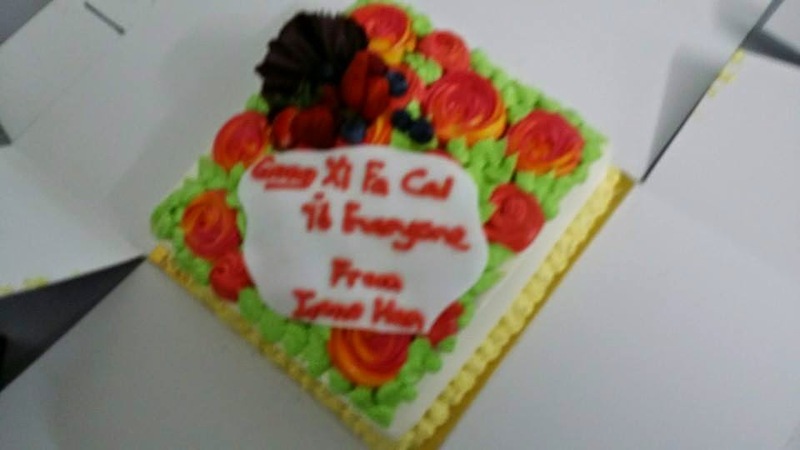 We had a fabulous “Chap Goh Meh” eve meeting and we enjoyed ourselves very much with the delicious cake brought by Irene Han. Thank you, Irene. 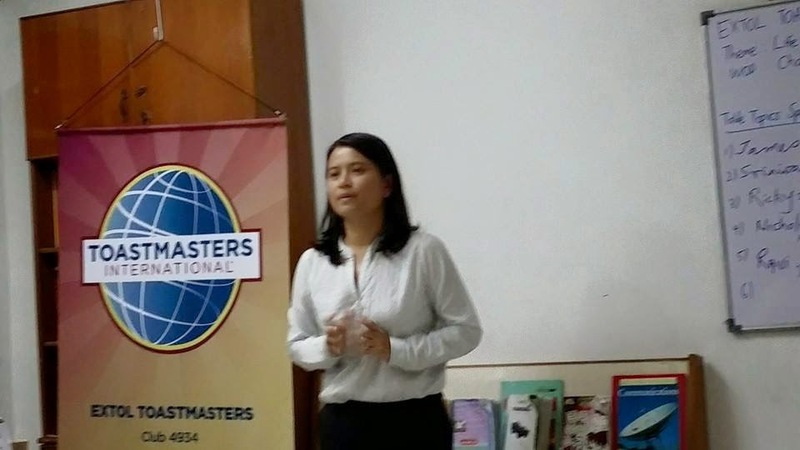 Our heartfelt thanks to C P Lau, ACB, ALB from Money Mastery KL Toastmasters Club, the General Evaluator of this meeting. Thank you, CP for your presence! 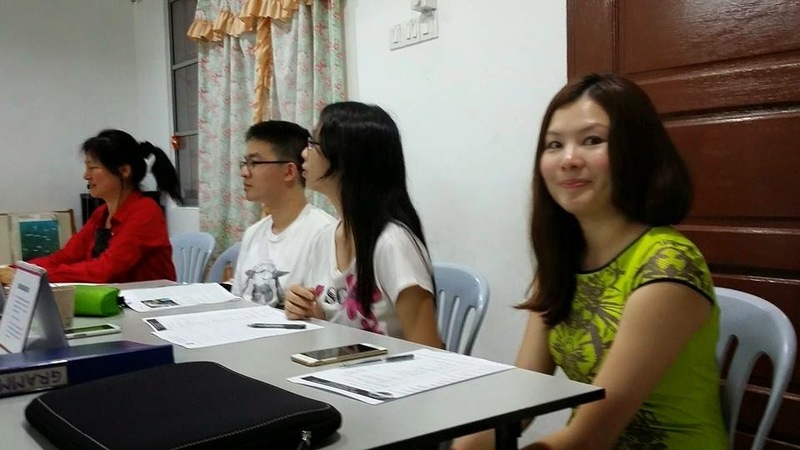 We also welcomed our guests, Alicia Leong, (Irene Han’s daughter), Nicholas Khoo (PY Wong, ACB’s friend), Sheffa Mashuri and Robin Cheng from MAD Toastmasters Club for attending the meeting. 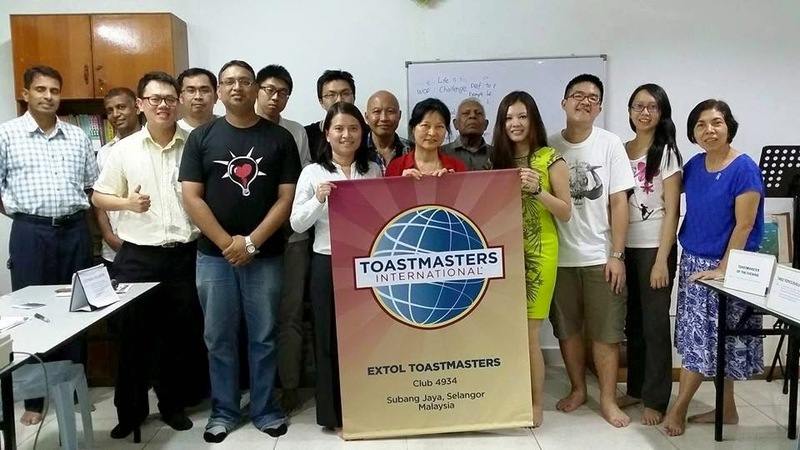 We are also glad to announce that Nicholas Khoo and Sheffa Mashuri joined our happy Extol family at this meeting. Welcome, Nicholas and Sheffa! ASA, Mohmmad Muslim called the meeting to order at 7.12pm. Great job, Muslim! 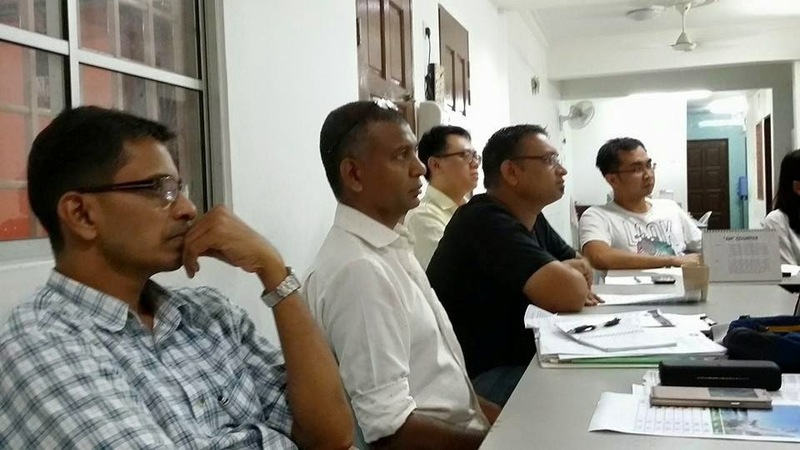 TME, Pun Yew Kee conducted the meeting smoothly, efficiently and effectively. Excellent job, Yew Kee! 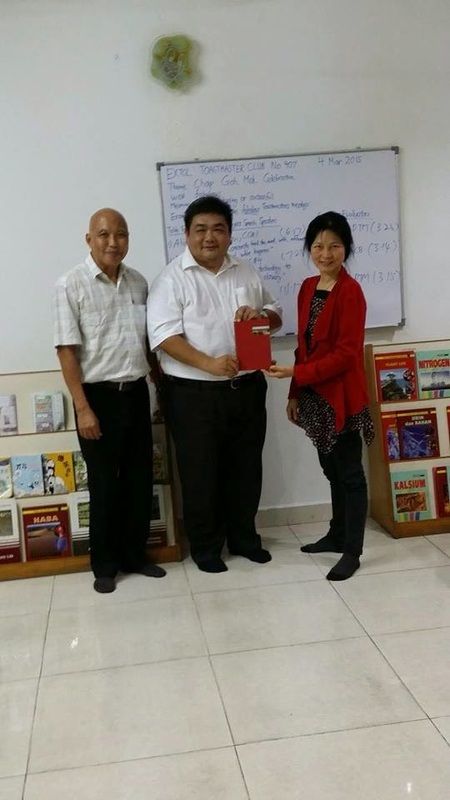 President, Jeannie, ACS explained the reason for the theme, “Chap Goh Meh” celebration. This meeting was on the eve of “Chap Goh Meh”, and “Chap Goh Meh” is the last day of the Chinese New Year. In ancient days, “Chap Goh Meh” was celebrated by hanging red lanterns all along the streets and shy, blushing, eligible young ladies would throw mandarin oranges with their names and contact details inscribed on them to eligible young men of their choices. Thank you for the explanation, Jeannie! Invocator, SK Ratnam, DTM boosted our spirits with stories on concepts of responsibility, understanding and empathy. Thank you, SK! Table Topics Master, Ken Koh, ACB based his Table Topics on the Chinese New Year theme and aroused everybody’s interest and excitement. Well done, Ken! 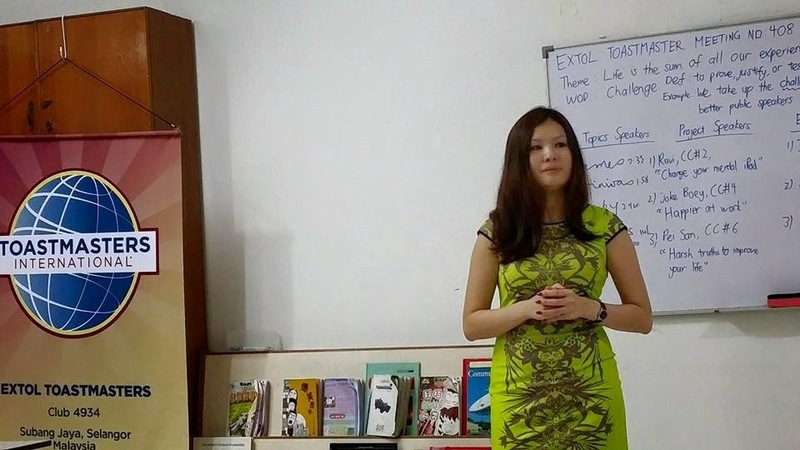 The first brave Table Topics speaker, Alicia Leong said that the reason for visiting friends and relatives during Chinese New Year was to improve their relationship with each other. 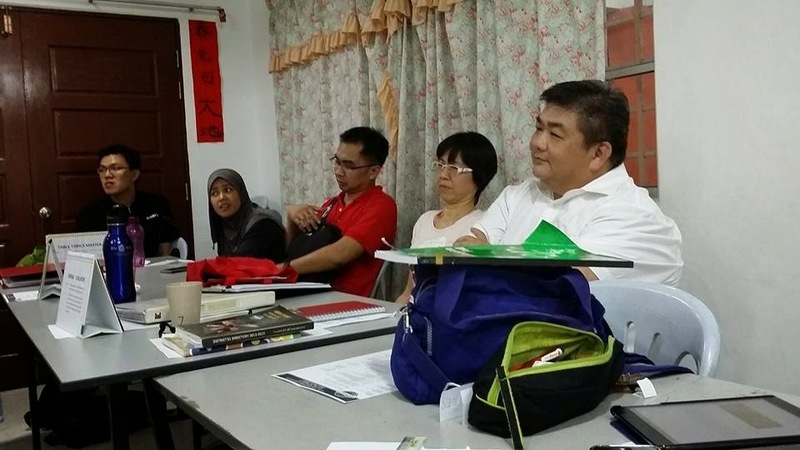 Nicholas Khoo elaborated on all the preparations that he carried out on Chinese New Year eve. Mohmmad Muslim described and compared the Chinese New Year food with the Indian food which he had tasted and enjoyed. Sam Koh wished that everybody enjoyed good health, and practiced positive thoughts and actions in this Year of the Goat. 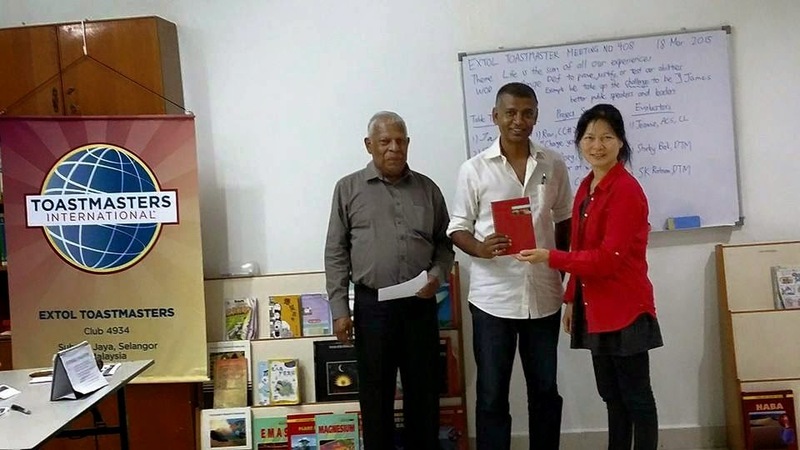 Robin Cheng narrated the red lanterns, mandarin oranges, Chinese New Year cookies, tea ceremony for parents to receive blessings and “angpaus” (red packets) that are part and parcel of the Chinese culture. Well done, all the five courageous spontaneous speakers! 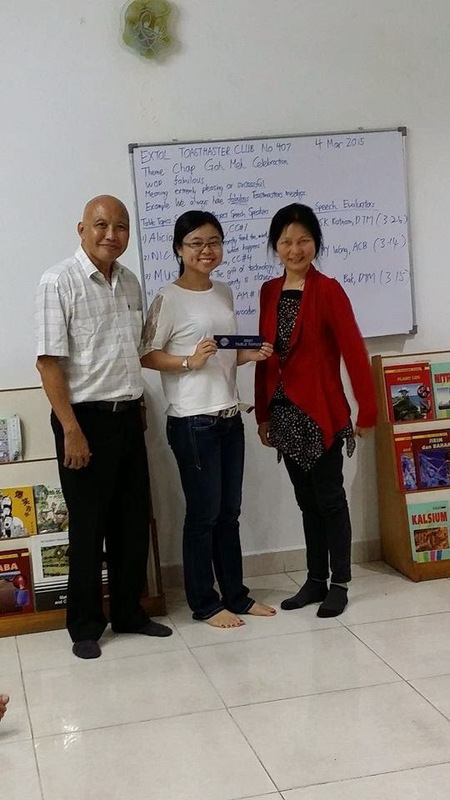 And the best Table Topics Speaker went to Alicia Leong. Congratulations, Alicia! As usual, Humour Master, SK Ratnam, DTM amused us with his humourous stories about a woman who is like the moon, a funeral and a marriage certificate. You never cease to delight us, SK! Table Topics Evaluator, Shirley Bak, DTM, gave concise evaluations on all the five valiant impromptu speakers providing pointers and praises as warranted. Stupendous job, Shirley! 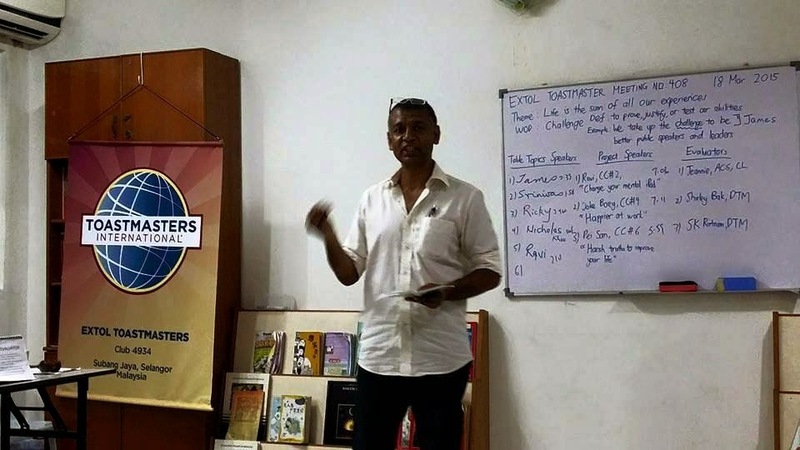 Ravi presented his Ice Breaker titled, “Constantly feed the mind with affirmation and what happens” which not only informed us about his childhood, his growing up years and working life but was also so inspirational. Beautiful speech, Ravi! 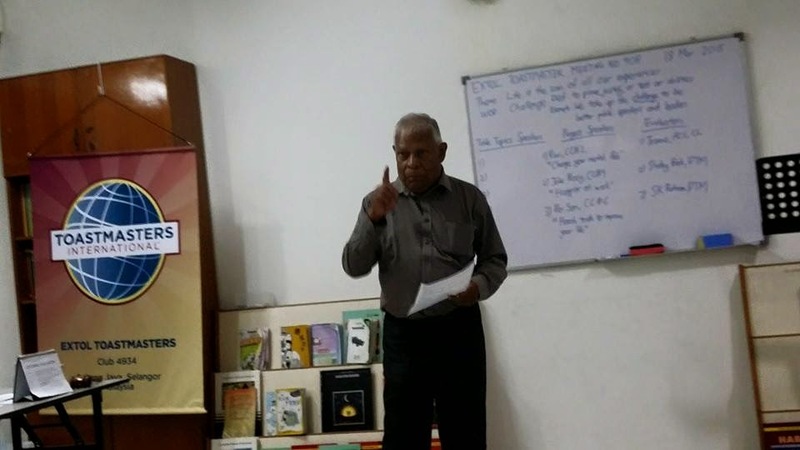 His evaluator, SK Ratnam, DTM was awed with his inspiring speech which was good enough for CC#10, although he hoped that in future Ravi shortened his speech title. Thank you, SK! Second speaker, Mohmmad Muslim presented CC#4 titled, “The gift of technology to humanity is slavery”, which was very apt in our present society where human relations are continuously strained due to over reliance and involvement on technology! Very ground-breaking speech, Muslim! His evaluator, PY Wong, ACB was thrilled with the contents of his speech which was so reflective of today’s society. Thank you, PY! Ken Koh, ACB presented AM#1, Storytelling, The Folk Tale, titled ”The wooden boy in today’s world” which was adapted from the story of Pinocchio into a modern version which was very innovative, interesting and entertaining. Very innovative speech, Ken! His evaluator, Shirley Bak, DTM was happy with his storytelling ability and adaptation of the folk tale from its original but warned him that he should have kept to the original version instead. Thank you, Shirley! 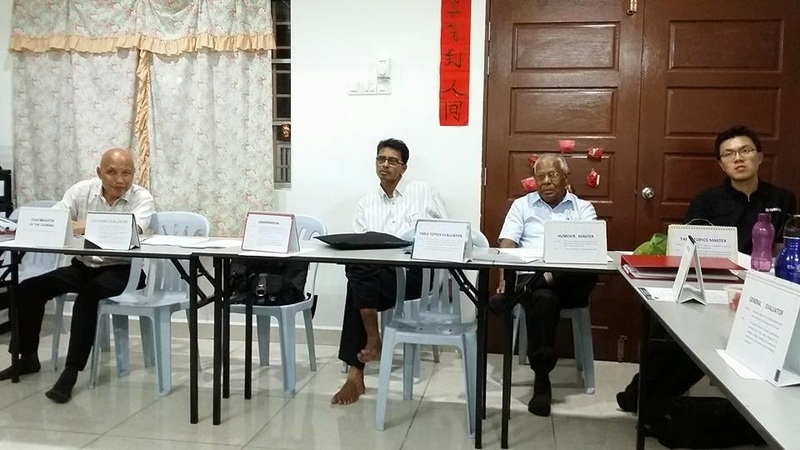 As Ken Koh, ACB went overtime and only two project speeches were delivered within the allocated time frame, there was no voting for best speakers. And the Best Evaluator went to SK Ratnam, DTM! Ah Counter, Robin Cheng was very observant and gave a detailed report of all the word crutches used during the entire meeting. Well done, Robin! Grammarian, Ravi was very attentive and reported on all creative sentences and also wrongful use of words and sentences by the speakers. Good job, Ravi! 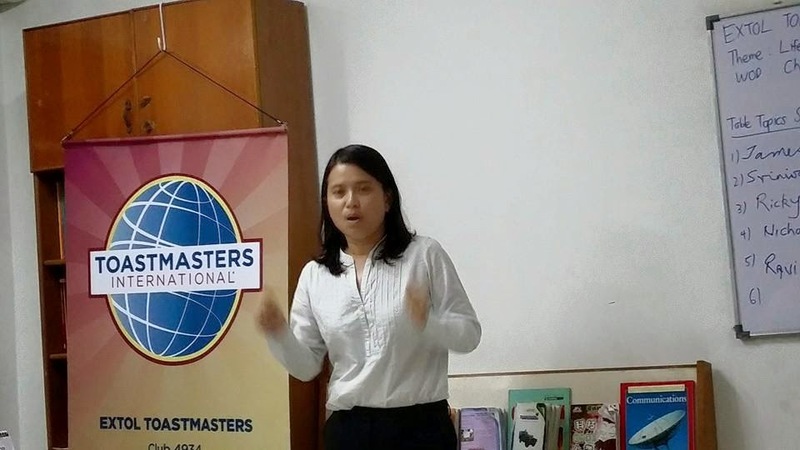 Timer, Irene Han gave a precise timing report of the whole meeting! Marvelous job, Irene! Jeannie, ACS, the Listening Evaluator gave ten seemingly easy questions but only Mohmmad Muslim got eight correct answers who received the Best Listening award. Awesome job, Jeannie and congratulations, Muslim! 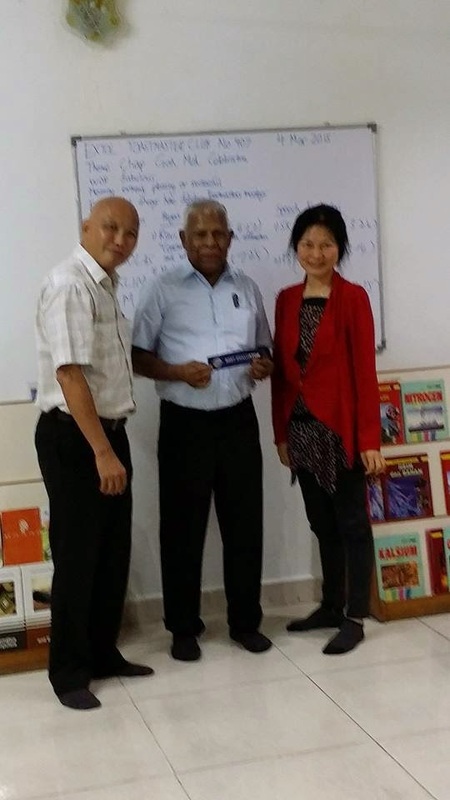 General Evaluator, C P Lau, ACB, ALB commented that he was very warmly welcomed upon arrival, he was glad to see familiar faces and he hoped to visit our club again. However, he hoped that the Toastmasters Promises could be recited at our club meetings as was practiced at his own club. Thank you, CP, we shall take note of your comments and hope to see you at our meetings again, too! In closing, President Jeannie, ACS announced that the Division C International Speech and Table Topics Contests will be held on 12 April 2015 at MIDA, KL Sentral at 12.00noon. Everybody was encouraged to go and watch the Area champions in action! Goodnight!! Our next meeting is on 18th March 2015!